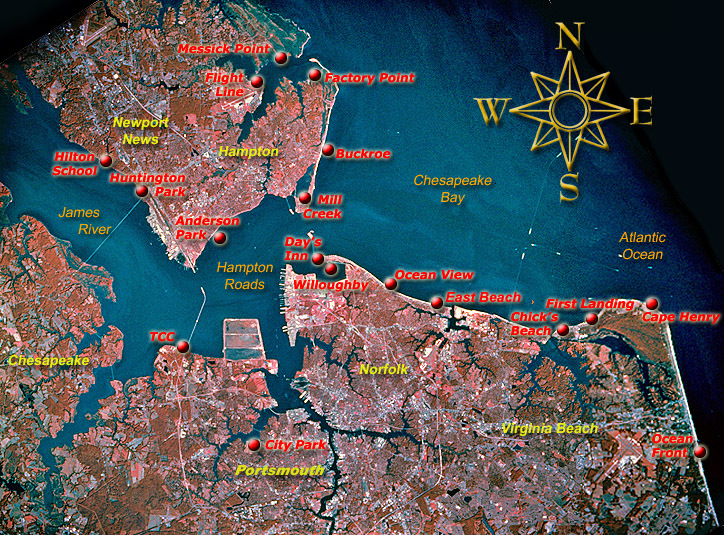 The following map pinpoints the launches of the Hampton Roads area. Click on a launch for detailed information. Click on the arms of the compass rose for launches favorable to the desired wind direction. York River launches can be found here. Hatteras launches can be found here while Northern launches from north of Hampton Roads to just South of New York City can be found here. The Norfolk metropolitan area can be seen in this near vertical view. Vast amounts of sediment can be seen flowing into Hampton Roads from the James and Nasemond Rivers. Chesapeake Bay is visible. Barely discernible is the Chesapeake Bay bridge and tunnel road that connects mainland Virginia with the southern tip of the Delmarva Peninsula. The city of Norfolk is located on the south side of Hampton Roads on the Elizabeth River. Norfolk is a major port of entry in the eastern United States, and a major commercial, industrial, shipping, and distribution center. With the cities of Portsmouth and Newport News, Norfolk forms the port of Hampton Roads, one of the best natural harbors in the world. Norfolk and Portsmouth form an extensive naval complex and operations base (the largest in the United States). It is here in Hampton Roads in 1862 that a major Civil War battle between the ironclad ships Merrimack and Monitor was fought. It is also here in Norfolk that one of the United States most famous Army generals, Douglas MacArthur is buried.